Добавить в корзину 1 шт. на сумму 6 100 руб. The PhaseCap B25667C series from EPCOS are Power Factor Correction (PFC) metallised polypropylene film capacitors. Constructed from a polypropylene film dielectric, these PFC capacitors are encased in a cylindrical aluminium case with a threaded stud. EPCOS film capacitors are wave cut and have concentric winding. With optimised safety terminals and a triple safety system, this series features a ceramic discharge module. 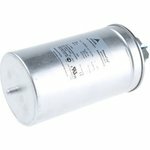 B25667C film capacitors are naturally air cooled and suitable for indoor mounting.